I think most of you know I'm more of a bag than a shoe person. The question still remains: what's in the bag? 1. My iPhone - actually the core of my bag's content - I feel kinda naked without! What do you think about this awesome monkey case? 2. Retro sunnies - since the sun has (finally) showed up his face again it's simply impossible to leave the house without some cool retro sunnies. Also very appropriate when peeking at people from the terrace. 3. A fresh and floral perfume - 'dot' from Marc Jacobs completely fits the description at this point. 4. Music - can't survive the day without, so I carry my iPod with me everywhere I go. Currently listening to Oliver Schories, Illesnoise, Alle Farben, Kensington and Coldplay. 5. Beauty goods - a mini Chanel mascara and Dior hand cream always come in handy. Leuk om te zien! Je tas is erg mooI! Great post! I love the perfume and the beautiful bag! Would you like to follow each other on bloglovin? The purse is super cute. And I have a similar iPhone case. Nice post! Super leuk om te zien. Love the sunnies! such a cute phone case!! Vind deze zonnebril ZO gaaf!! Super lief tasje, en ik vind je zonnebril en telefoonhoesje zo tof! how cute is your phone cover?? and loving your sunnies. Hele leuke post en wat een geweldige sunnies! Wouw wat zie je er prachtig uit! I really like this post. So personal!! Love the phone case, lovely!! Leuk tasje en hoesje van je telefoon! Heb je geen geld of portemonnee mee? 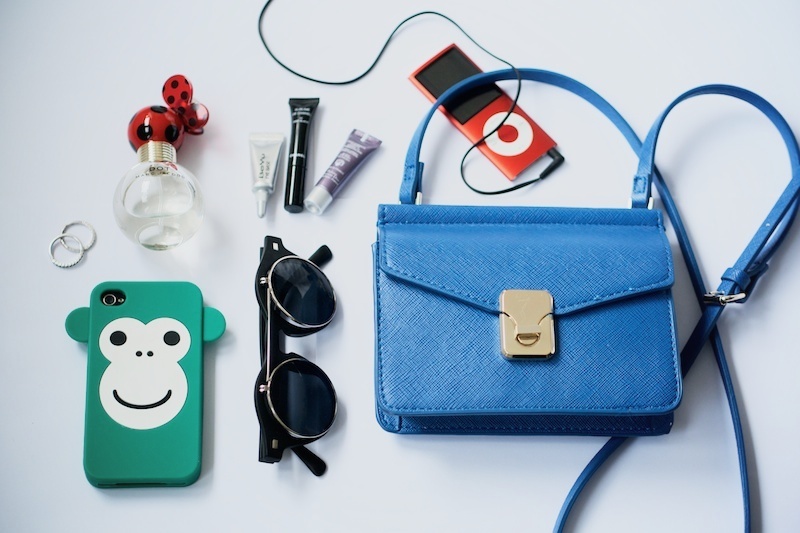 Leuke iphone case en opvallend mooie blauwe tas!